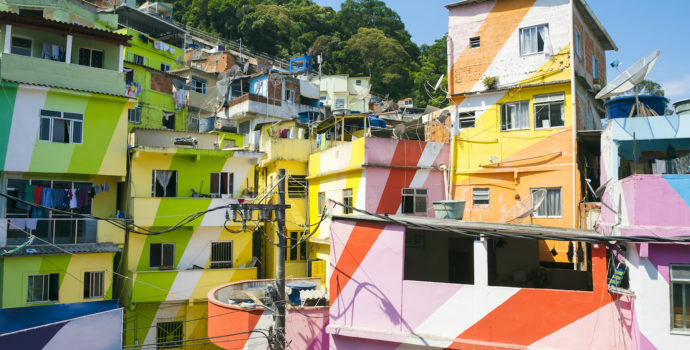 Arrive in Rio de Janeiro on Day 1, and take a walking tour of this vibrant city. On Day 2, visit Corcovado and go to Pedra Bonita for a hike and the most rewarding views. 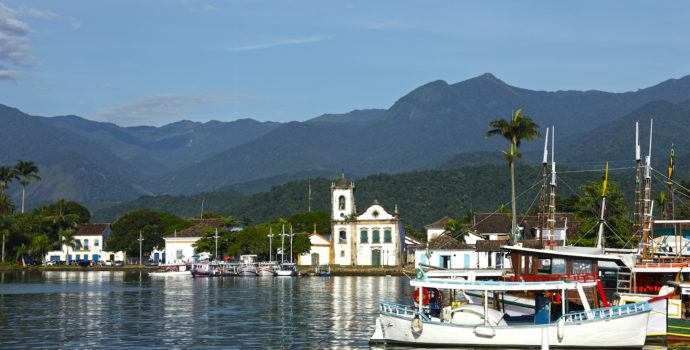 On Day 3, head from Rio de Janeiro to Paraty and enjoy a walking tour of this colonial village. Head to Quilombo Campinho da Independência community for a morning tour on Day 4, then kayak the pristine waters of Paraty Bay. 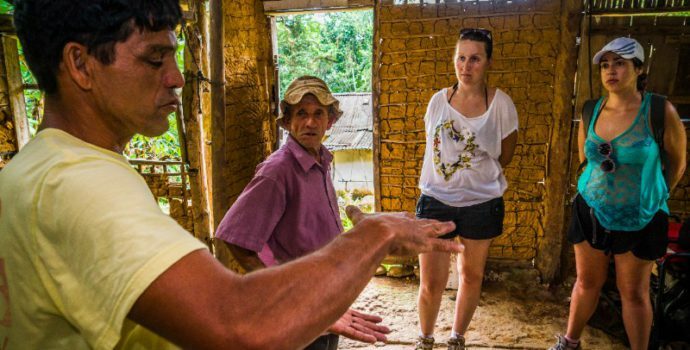 On Day 5, transfer to Laranjeiras then hike to an Authentic Fishing Village for the night. 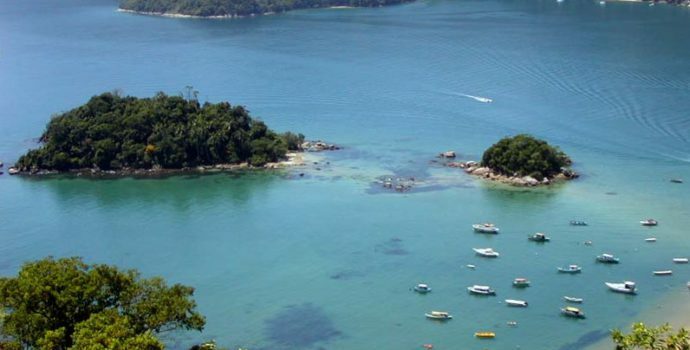 Head back to Paraty on Day 6, then take a boat to Ilha Grande on Day 7. Tour Lagoa Azul by boat on Day 8, then head back to Rio de Janeiro on Day 9. Your trip comes to an end on Day 10. 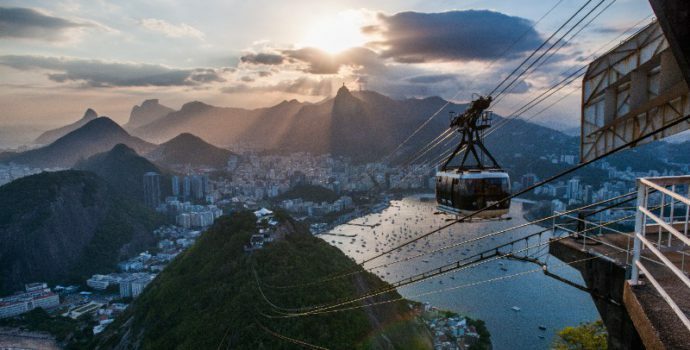 Arrive in Rio de Janeiro and make your own way to your accommodation. From here, you will head out on an immersive walking tour of the beautiful streets of Copacabana, Ipanema, and Leblon. Make sure to try some açaí or coconut water along the way! After the tour, we’ll head back to your accommodation in time for a ground meeting around 7 PM. After the meeting, we’ll have the opportunity to head back out to the city for a group dinner (not included) that our guide can recommend. An optional caipirinha nightcap is always a good idea! After dinner, feel free to spend the rest of the evening at your leisure. Overnight in Rio de Janeiro. After breakfast, we’ll head out to Corcovado via public transportation (bus or metro). For groups larger than 9 people, private transportation will be considered. Arriving at Corcovado, we’ll step into the centenarian eco-friendly electric train (ticket included), which cuts through the well-preserved Atlantic Forest, part of Tijuca National Park. The train tracks end at the foot of Cristo Redentor, one of the Seven New Wonders of the World. One of the most iconic sights of the beautiful city of Rio de Janeiro. After a quick lunch (not included) at a local restaurant recommended by our guide, we’ll take public transportation from Corcovado to Pedra Bonita. Pedra Bonita is mostly known as the hang-gliding and paragliding headquarters of Rio. The views at the summit are astonishing, you will be facing the massive Pedra da Gavea Mountain and the endless Atlantic Ocean, to the east you will get to see the Favela of Rocinha and the Pedra Bonita Hike. After this incredible day, you’ll have the option to stop for dinner (not included) en route back to the accommodation. Feel free to spend the rest of the evening at your leisure. Overnight in Rio de Janeiro. After an early breakfast, we’ll head out on a road trip towards Paraty, around 250 kilometers (4 hours) away. Upon arrival, we’ll hit the streets for a walking tour of this charming little colonial town. 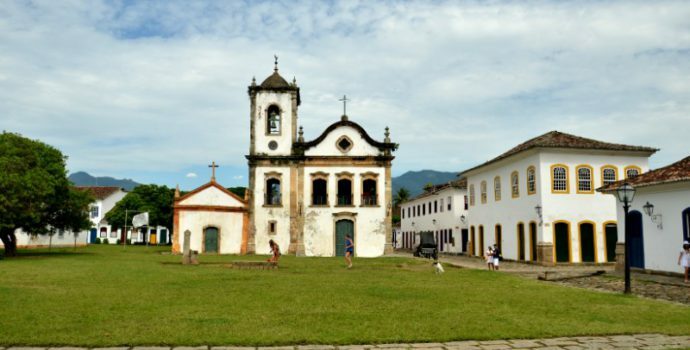 Along the way, your expert local guide will take you back in time to the Portuguese discovery of Brazil, tracing the development of Paraty through the sugar, gold, and coffee booms. 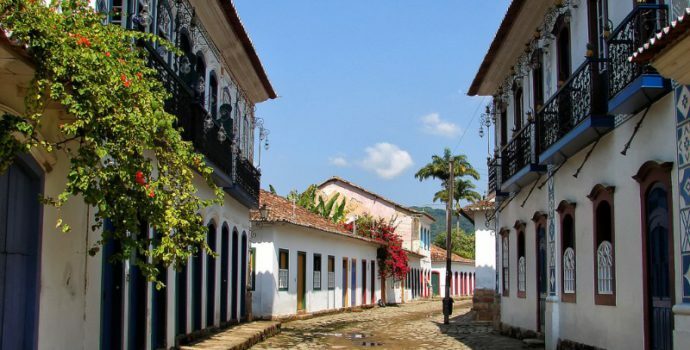 Beautiful colonial architecture, innovative (for its time) street design, exiled Portuguese royalty, and the dark past of the slave trade – these are just a few of the elements that make up Paraty’s rich and colourful history. Your guide will be able to recommend places to stop for lunch and dinner (not included). After the walking tour, you are free to spend the rest of the day at your leisure. Overnight in Paraty. After breakfast at your accommodation, we’ll head out to the Quilombo Campinho da Independência community for a morning tour. Quilombo Campinho da Independência was the first state of Rio de Janeiro to receive its titled lands. On the tour, we’ll have a chance to discover the history of descendants of slaves in the area, as well as the gorgeous nature that surrounds the community. We’ll visit some local households, a flour mill, as well as listen to some stories from residents of the community. To top it off, we’ll enjoy a cultural presentation of the local dance, Jongo. During the tour, we’ll stop for lunch (included). After lunch, we’ll embark on a kayak tour of the warm, crystal-clear waters of the bay of Paraty. On this guided tour, we’ll visit various islands and beaches that dot the bay. 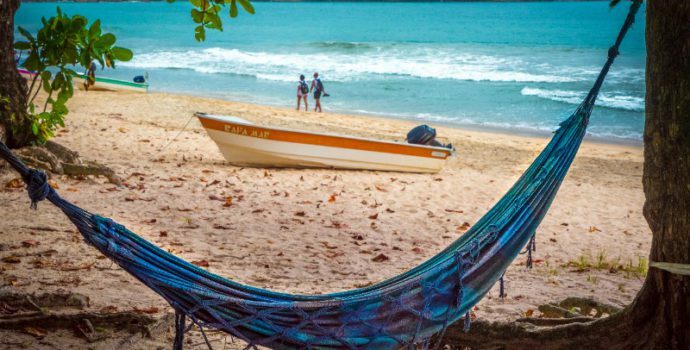 Along with kayaking, we’ll have the option to enjoy some swimming and snorkeling, all the while surrounded by the region’s particular natural mangrove climate. It’s the perfect way to escape the busy boat-tripping crowds! After the tour, we’ll head back into town, where your guide can recommend some great spots to enjoy a delicious dinner (not included). Feel free to spend the rest of the evening at your leisure. Overnight in Paraty. 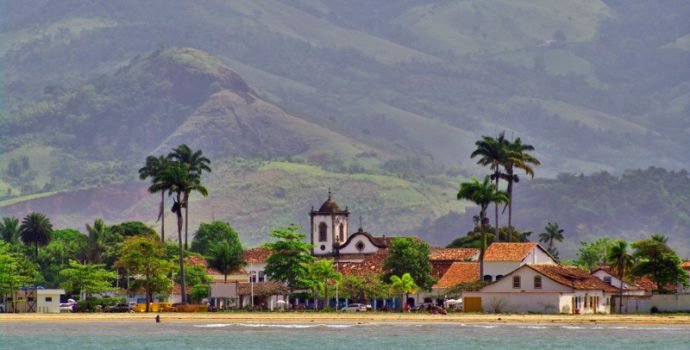 After enjoying breakfast at your accommodation, we’ll hop on a bus from Paraty to Laranjeiras – a 30-minute ride. Once we arrive in Laranjeiras, we’ll begin our hike towards an Authentic Fishing Village – accessible only by boat or foot. 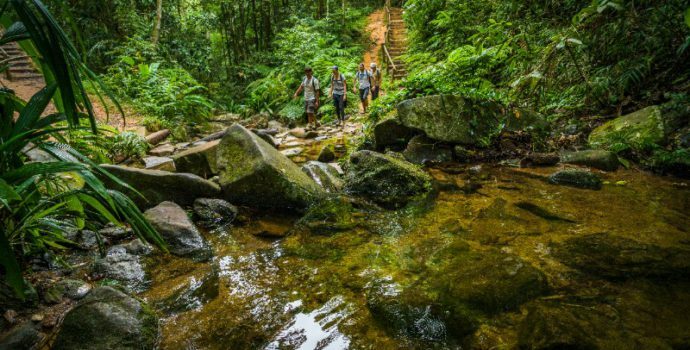 The hike itself is a sight to behold – directly next to the Atlantic forest, it’s easy to spot the numerous animals and infinite bromeliads that inhabit this place. We’ll grab lunch along the way at Praia do Sono. 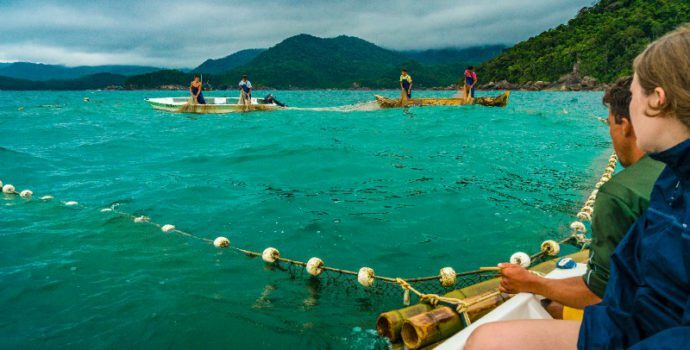 Arriving at the Authentic Fishing Village is breathtaking in itself – it’s striving to maintain their traditional lifestyle in conjunction with nature. The beach, with its white sand and crystal-clear waters, is very quiet, yet it remains a rarely-visited destination. Time to relax. 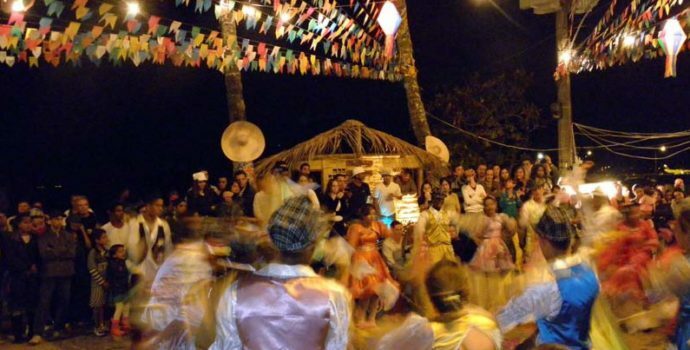 This evening, we’ll have dinner with the local community, during which we’ll have the chance to listen to Caiçara stories and truly feel that connection to the local culture. Overnight in the Authentic Fishing Village at a local home. In the morning, we will have the opportunity to spend some time interacting with the local community. Activities will be organized according to the weather, and you will be able to choose from a number of different activities, including fishing with the local fishermen, visiting the local flour-producing factory, and visiting a beautiful waterfall close to the village. After we complete our activities, we’ll head back to Laranjeiras, this time on a private boat. Upon arrival, we’ll board a bus headed back towards Paraty, after which you are free to spend the rest of the day at your leisure. Overnight in Paraty. 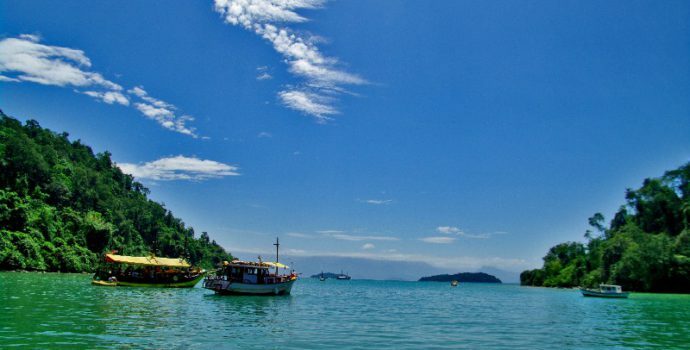 Today, we’ll head from Paraty to the beautiful tropical island of Ilha Grande. From Paraty, we’ll board a bus headed towards Conceição de Jacareí (2 hours), and from there we’ll grab a boat to Ilha Grande (40 minutes). Upon arrival, we’ll check into our accommodations for the evening, after which we will head out for a comprehensive (and moderately difficult) walking tour of the island. Starting from Abraao Village, we’ll make our way to the trail. During the hike (along steep, uneven terrain), we’ll pass the Arches of the Old Aqueduct, gorgeous waterfalls, and lush flora and fauna. Later, we’ll have the chance to take in some incredible views of the Atlantic Ocean before reaching the beach. After the six-hour hike (with an optional taxi-boat return service), you are free to spend the rest of what will certainly be a beautiful evening at your leisure. Overnight on Ilha Grande. After a quick breakfast at your accommodation, we’re going to head out on a boat tour for the day. First stop is Lagoa Azul, a stunning locale which has preserved the wild and natural environment of the region. 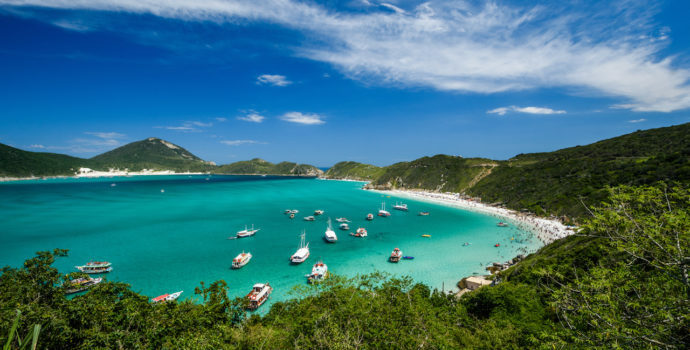 We’ll drop anchor between two islands where we can enjoy the transparent blue waters, beautiful backdrops of coral, and a variety of colorful Brazilian fish. 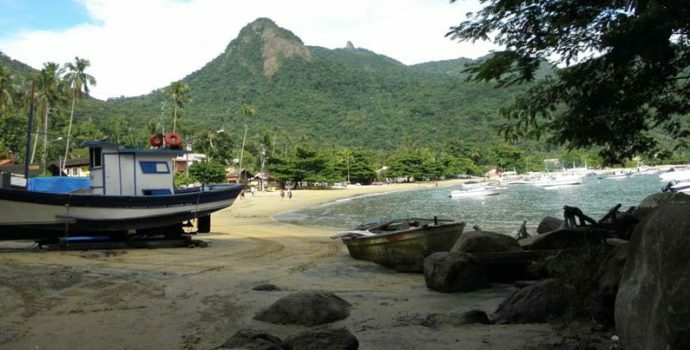 After Lagoa Azul, we’ll make a stop at Freguesia de Santana Beach, located near Santana, the first established town of Ilha Grande. Besides relaxing on the beach, make sure to make a stop at the Church of Santana. Once we’re finished here, we’ll hop back into the boat and head back into town in time for an early evening arrival. You’re free to spend the rest of the day at your leisure. Overnight on Ilha Grande. After breakfast at your accommodation, we’ll hop into a boat headed back to Conceição de Jacareí (40 minutes), after which we’ll board a bus back to Rio de Janeiro (2 hours). Tonight we’ll have a farewell dinner (included) at a Brazilian barbecue restaurant, called a “churrascaria.” After dinner, feel free to spend the rest of your final evening at your leisure. Overnight in Rio de Janeiro. After checking out of your Rio de Janeiro accommodations and enjoying breakfast (included), your trip comes to an end and you are free to continue on to your next destination. Safe travels!